"Exclusive: In Leaked Audio, Brian Kemp Expresses Concern Over Georgians Exercising Their Right to Vote," reported Rolling Stone Tuesday. Wow, the Republican candidate for governor secretly attacking the right to vote in undercover audio? I bet this is really juicy, and not at all misleading clickbait garbage! Not long after Kemp began his remarks, the candidate expressed worry about early voting and "the literally tens of millions of dollars that they [the Stacey Abrams camp] are putting behind the get-out-the-vote effort to their base." Kemp then asserted that much of that Abrams effort is focused on absentee ballot requests. "They have just an unprecedented number of that," he said, "which is something that continues to concern us, especially if everybody uses and exercises their right to vote — which they absolutely can — and mail those ballots in, we gotta have heavy turnout to offset that." In context, it's pretty clear that "everybody" means everybody who received an absentee ballot from his opponent, Democrat Stacey Abrams. 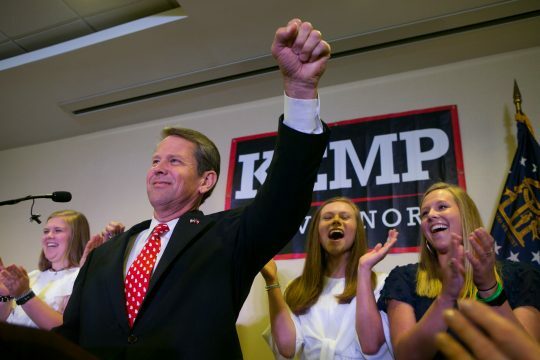 It's also exceedingly clear that Kemp did not "[Express] Concern Over Georgians Exercising Their Right to Vote," but expressed concern about Georgians voting for his opponent. The headline is just not an accurate or fair representation of what Kemp was actually saying; by that standard all politicians are concerned about Americans "exercising their right to vote." As best as I can tell, the crime here is that a candidate for office told supporters that he was worried about the get-out-the-vote and absentee balloting efforts of his opponent. And Rolling Stone is proud of this "Exclusive." Rolling Stone even seems to recognize the whole thing is kinda weak, writing that "It is fairly typical for a political candidate expressing confidence in his campaign to lament his opponent’s efforts to increase turnout." But then they forward an explanation for why it's Actually Scandalous for Kemp to do so. But Kemp’s position as Georgia’s Secretary of State clouds his statements. While it is not uncommon for someone in such a position to be on a ballot during an election that he or she oversees — they do have to run for re-election, after all — the state’s top elections official speaking of "concern" about increased early and absentee voting raises further questions about a conflict of interest. Again, Kemp's "concern" was not about early and absentee voting in the abstract. He also made his comments in a private, campaign event to ticketed donors; he clearly wasn't speaking in his capacity as a state official. Of course the story spread like wildfire on social media, thanks to left-leaning pundits or journalists who went with the highly misleading headline or a parsed version of the quote that omitted that Kemp was only talking about "everybody" being targeted by the Abrams campaign. The real reason this is even being discussed is because it plays into the debate over the 53,000 voter registrations Kemp's office has placed on hold, in compliance with a 2017 law requiring an "exact match" between voter registration and state or federal records. As Rolling Stone notes, the Abrams campaign is incensed, accusing Kemp of "voter suppression" and pointing to an AP report finding 70% of the voters placed on hold are African-American. Kemp claims that the reason for the racial disparity is actually Abrams' fault, due to a large volume of erroneous and sloppy registration forms dating back to when she headed the nonprofit New Georgia Project. I'm wary to weigh in on a controversy involving complex state election laws, but the "exact match" law strikes me as uncommonly silly. If an "Alex Griswold" who lives in 1823 M St NW registers to vote and state records indicate an "Alexander Griswold" lives at 1823 M St NW, they are probably the same person and that should be the end of it. But I also think the Abrams campaign and their liberal allies overstate their objections somewhat. Voters placed "on hold" can still vote if they provide ID that "substantially" reflects their name (photo ID is already mandatory in Georgia), so voters with minor discrepancies will almost certainly be allowed to vote in the end. None of this matters. Every campaign wants to "suppress" the vote for their opponents through rhetoric or campaign tactics, but it doesn't then follow that they support putting up legal barriers to the vote. Kemp in no way attacked Abrams supporters' legal right to vote ("they absolutely can" is most credibly read as an affirmation of their rights). It makes no sense to take election chatter that literally any campaign would make—"We hope our opponent's voters don't turn out"—and present it as evidence of the new Jim Crow. This entry was posted in Politics and tagged Brian Kemp, Rolling Stone, Stacey Abrams. Bookmark the permalink.